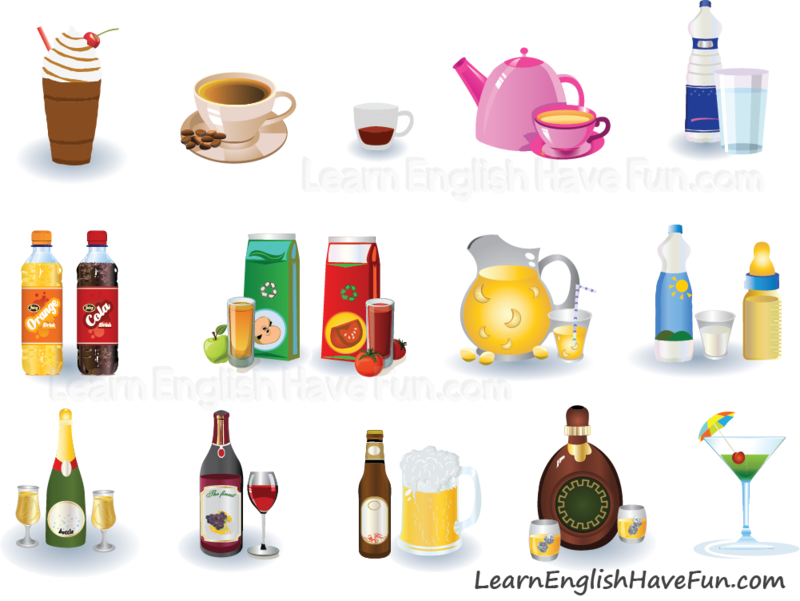 Beverages vocabulary words are very important words to know in English if you're feeling thirsty (want something to drink). In English we also call beverages "drinks." The word drink is slightly less formal than beverages. 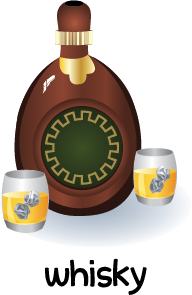 The word drink is often used to describe an alcoholic beverage. A gin and tonic is a nice drink to have on a hot day. Would you like to go out for drinks this evening? The video provides a chance to hear some popular beverages pronounced. 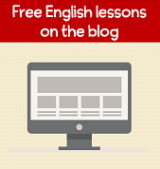 There is a pause after each word so that you can say the words to practice your pronunciation. 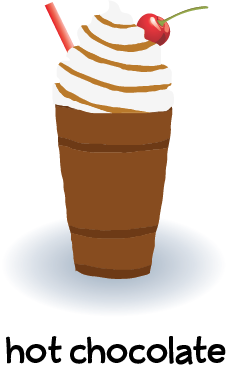 Click the audio player below to hear the beverages vocabulary video. Now that you've heard the words pronounced, you can review the whole list of beverages vocabulary covered in the video. 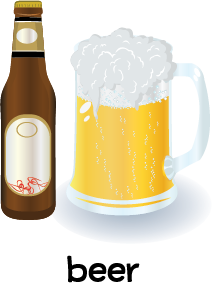 beer: an alcoholic beverage made from malt and flavored with hops. 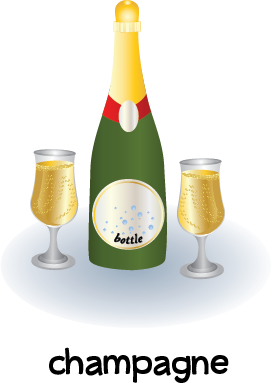 champagne: a sparkling wine made in Champagne, France, which is often consumed at special occasions like New Year's Eve and at weddings. 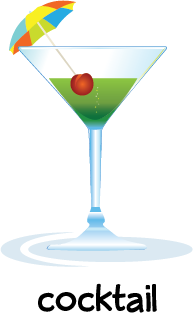 cocktail: an alcoholic drink that is made of one or several liquors plus another substance such as juice, tonic water or soft drinks (e.g., martini, rum and Coke, margarita). 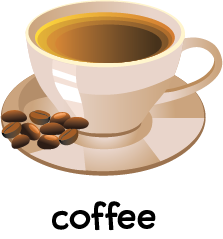 coffee: a beverage made from ground roasted coffee beans and water. 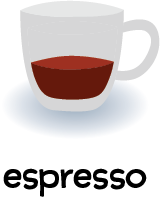 espresso: a strong coffee drink made by pressing hot steamed water through ground roasted coffee beans. hot chocolate: this drink is also called hot cocoa. It is made with chocolate and hot milk (or water) and is often served with whipped cream, a cherry and chocolate sauce. 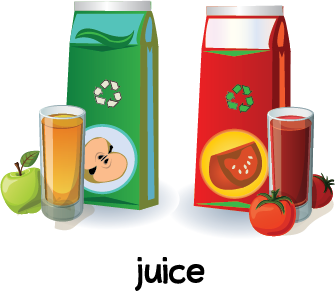 juice: the liquid part that can be pressed out of vegetables and fruits (e.g., tomato juice, orange juice). 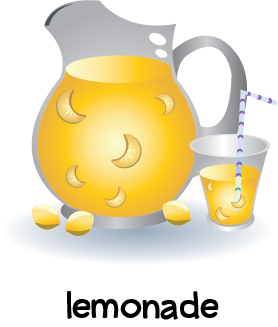 lemonade: a cold drink made from the juice of squeezed lemons, water and sugar. It is frequently served over ice cubes. 1. a white liquid produced by female animals for their young (humans of all ages often drink cow's and goat's milk). tea: a drink made by placing tea leaves (or the leaves of other plants) in boiled hot water. Tea can be served hot or cooled and then served over ice (iced tea). water: a clear, odorless and tasteless liquid. 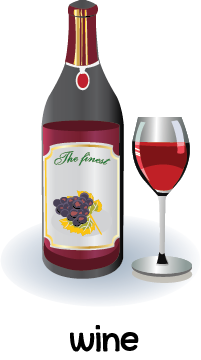 wine: an alcoholic drink made from grapes. alcoholic drinks / beverages: drinks that contain alcohol such as wine, beer, whisky, cognac, vodka, gin, tequila, etc. non-alcoholic drinks / beverages: This category of drinks does not have alcohol. Examples include soft drinks, juices and herbal teas. 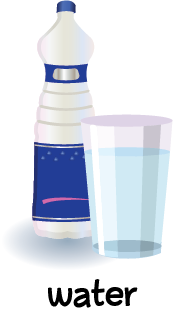 decaffeinated drinks / beverages: These drinks have the caffeine (or most of it) removed from the beverage. These are mostly coffees and teas. We often call them "decaf" rather than saying decaffeinated (e.g., decaf coffee, decaf espresso). caffeine-free drinks / beverages: These drinks do not have caffeine (they never had caffeine in them). 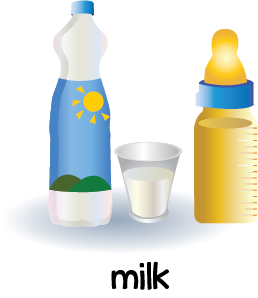 This includes drinks like juices, milk, water, certain soft drinks, lemonade, herbal teas (infusions), etc. 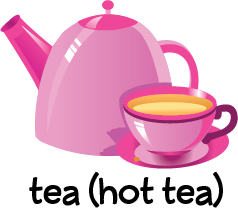 hot beverages / cold beverages: Beverages can be consumed hot or cold so sometimes we also need to be specific about whether we want a hot beverage or a cold one (e.g., hot tea, iced tea). fountain drinks / fizzy beverages: Drinks that have bubbles or are carbonated (the drink is dispensed from a machine). 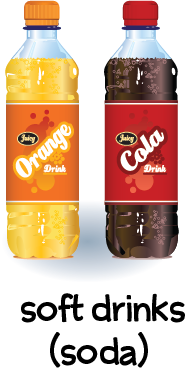 Soft drinks such as colas are frequently served from a fountain machine instead of from a can or bottle. some / any / a bottle of / a glass of / a can of: Drinks are liquids and this makes them "uncountable" nouns. 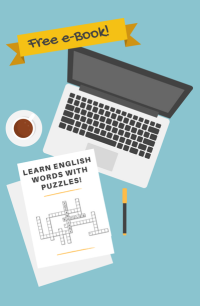 With uncountable nouns you cannot count the amount of the liquid—unless you put it in a container such as a bottle, can, glass, etc. This is the reason we ask for "some" / "any" + beverage name. I'd like some water please. Do you have any diet Coke? I'm sorry but we don't have any alcoholic beverages here. Do you want some orange juice or apple juice? If you say I would like "a" water, it will be understood that you want a container filled with water (e.g., a glass or bottle). in bottles / in cans / on tap: If you drink beer, it is commonly served in cans, in bottles or from the tap (a faucet-like nozzle attached to a keg of beer). Do you want bottled beer or something on tap? What kinds of beer do you have on tap? I'd like six cans of diet coke please. We sell wine in bottles or mini-cans. Could I have something to drink? Do you have any alcoholic beverages? I would like to have a glass of orange juice please. Do you have any beer on tap? Do you have any specialty cocktails? May I have a decaf coffee please? What kind of beer would you like? Would you like red or white wine? Would you like ice in your drink? Would you like a hot tea or an iced tea? Asking for Identification / ID: In the United States, the legal drinking age is 21 years-old. Therefore, a waiter/server may ask you for your photo identification (ID) if you order an alcoholic beverage and look like you are younger than 21 years. 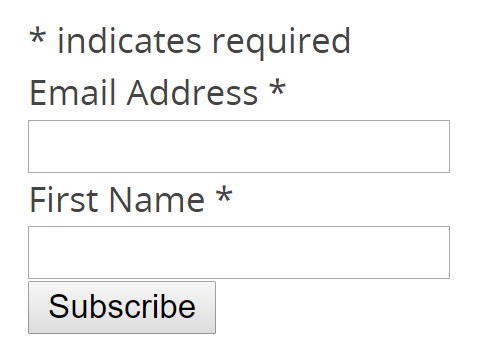 What is ID? It's something that has a photo and is issued by a government, such as a driver's licence or passport. You may also be asked for ID if you try to buy alcohol at a grocery or liquor store. Could I please see your ID? May I see some identification please? I need to see some ID. Can I see your driver's license or ID? Do you drink alcoholic drinks? What drinks are customary in your country? What do you drink in the summer? In the winter? What do you drink at breakfast?